Boy Meets Boy is unlike any other LGBTQ+ story I have read so far. Although there were a lot of conflicts throughout the novel, it felt almost utopian if that makes any sense. This story revolves around multiple characters with varying identities and it was quite refreshing to learn about them and their everyday teenaged issues. Goodreads synopsis: This is the story of Paul, a sophomore at a high school like no other: The cheerleaders ride Harleys, the homecoming queen used to be a guy named Daryl (she now prefers Infinite Darlene and is also the star quarterback), and the gay-straight alliance was formed to help the straight kids learn how to dance. When Paul meets Noah, he thinks he’s found the one his heart is made for. Until he blows it. The school bookie says the odds are 12-to-1 against him getting Noah back, but Paul’s not giving up without playing his love really loud. His best friend Joni might be drifting away, his other best friend Tony might be dealing with ultra-religious parents, and his ex-boyfriend Kyle might not be going away anytime soon, but sometimes everything needs to fall apart before it can really fit together right. This is a happy-meaningful romantic comedy about finding love, losing love, and doing what it takes to get love back in a crazy-wonderful world. Just by reading the first chapter alone, I knew I was going to love this story purely based on the beautiful way it was written. The writing style is very poetic and I found myself finding beautiful quotes on every page. Right away it is clear that this novel would be unlike many others in the LGBTQ+ genre. For one, everything and everyone is accepted. As stated earlier, everything feels very utopian. I’ve never seen a high school so accepting of every student, never mind an entire city/town. 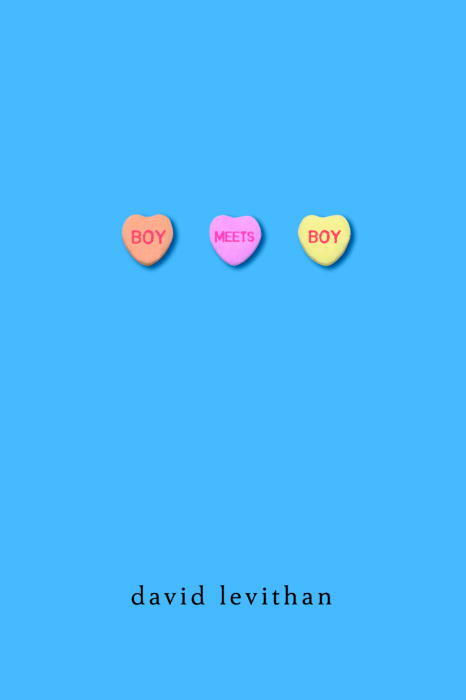 Rather than succumbing to the stereotypical conflicts found in most LGBTQ+ stories, Boy Meets Boy makes the characters sexuality feel secondary…as if it just happens to be just another detail of the character’s lives. The conflicts feel like they could belong to any gender/sexuality/race which makes this story relatable to anyone who chooses to read it. I loved the diversity of characters throughout this novel. Paul is an openly gay teenager who is accepted and loved by his family and friends, as a majority of the characters are. Paul is surrounded by a slew of diverse friends including Joni, his childhood best friend and Tony, a new addition to their group. Tony is one of the few characters that has to deal with parents who aren’t very accepting of his sexuality. Infinite Darlene is a drag queen who also happens to be both homecoming queen and the star quarterback. Kyle is Paul’s ex-boyfriend who is still a little confused about his sexuality. Then there is Noah, a new kid in school that Paul is immediately attracted to the second they meet. Although each of these characters are completely different from one another, they all fit together perfectly and compliment one another. Boy Meets Boy is a story that stands out from the rest. At times, things may seem a little to perfect, but for the most part it was fantastic to see such an optimal take on the LGBTQ community. I hope one day soon this “utopian” feeling can become an everyday reality. Boy Meets Boy does a great job in showing the world that it is possible for everyone to get along and live together peacefully. Thank you so much! You should!! It was so refreshing and worth the read! It’s also pretty short and fast paced!